Steph Curry 34 PTS, 6 REB, 5 AST; Draymond Green 12 REB, 8 AST; James Harden 28 PTS, 9 AST; Dwight Howard 13 REB. Steph Curry's dazzling 34 points gave the Golden State Warriors another nudge in the right direction to the real Championship gold as they drew the first victory in their Western Conference Finals matchup with the Houston Rockets. The Western Conference Finals kicked off with a boom as the Houston Rockets were taking on the Golden State Warriors where things kicked off in Oracle Arena. Golden State Warriors 110-106 Houston Rockets: Houston wasn't rested but they were physically active after coming back from the 3-1 deficit they faced before they could advance to the conference finals. It was the MVP vs the MVP Runner-up. The Rockets were out to a fast start when they went up by 7 after one and they were led by Ariza who scored 7. 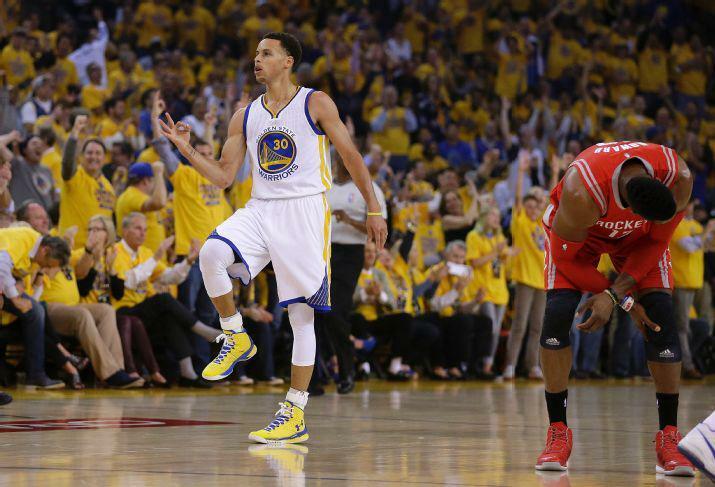 After the Rockets went down 14 midway through the second, the Warriors went on a 21-4 run going into the locker room. Shawn Livingston scored 14 points in this quarter and he helped Golden State rally back from a run they needed. They were up three after two. The Rockets kept up a fight and they weren't going down without one. The Warriors once stretched their lead to about seven near the end of the quarter but Harden hit a bank shot layup at the buzzer to only be down five. Curry was making everything as he scored 10 points in the third and they kept gaining momentum off him, he would drive the team to even want it more. James Harden played phenomenal in the fourth quarter, he was hitting step back jumper after step back jumper and tied the game up at 97 at a point. The Warriors then went up 9, but Houston went on a 9-0 run and were down two with 12 seconds left. But it wasn't enough as curry hit two free throws to make it a four point game and then the Rockets were done after that. Game one was a terrific game to watch, the game was so intense and fast pasted that the Rockets couldn't keep up and end strong in the fourth. Steph Curry leads the Golden State Warriors to a 110-106 victory over te Houston Rockets in Game 1 of the 2015 NBA Western Conference Finals.